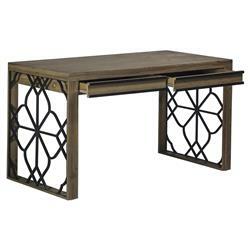 This ruggedly elegant writing desk makes the perfect addition to any home office. The whitewashed acacia wood frame has wrought iron accents in an elegant floral, quatrefoil pattern on either side of the base for an industrial yet delicate style. Two fully extendable drawers provide ample room to store and organize anything from office supplies to makeup.